Location/ Directions: I-240, exit Poplar East Exit (15-A). Turn right on Ridgeway, right on Park. Courtyard is on left in the Lakecrest Office Park. About Hotel: 3-Stories, 134-Rooms, Interior Corridors, Pets not allowed, Coffee/tea in-roo m, High-speed Internet access, Laundry on-site, Newspaper in lobby, Vending machines, Heated outdoor pool, Fitness Center, Hair Dryer, Iron and Ironing Board, Cable TV with free HBO, Individual climate control, Smoke Free motel, Chair, Alarm Clock, Desk, writing / work, with ergonomic chair, and electrical outlet, Cable channels include CNN, ESPN, and HBO. Railroad View: Very Good. This motel provides the second best view in Memphis (first being the Residence Inn). Any room on the Park Avenue side of the building should provide a good view. The higher floors are better to stay above the parking lot & traffic on Park Ave. Some trees obstruct the view, but there are few enough of those not to be an issue. Rooms have open balconies. At night, street lights on Park Avenue help light up passing trains. Railroads past Hotel: Norfolk Southern. You may see as much UP and BNSF locomotives as you will NS. Expect 25+ train's during a 24-hour period. Trains seen during my stay consisted of coal (and empty coal hoppers), double stacks, and general merchandise freight. Power on the coal trains were usually UP & BNSF complete with DPU locomotives on the rear. Just east of the motel, the railroad line becomes single track. One problem with that is some trains stop here to await clearance east; it may block the view of another passing train. Notes: I was here on a rainy / overcast day, I'm sure it would have been a nicer experience since this motel is located on the sunny side of the tracks. On sunny days, lighting on the trains should be very good in mornings & afternoons. Comments: As always, a very nice motel and well maintained! 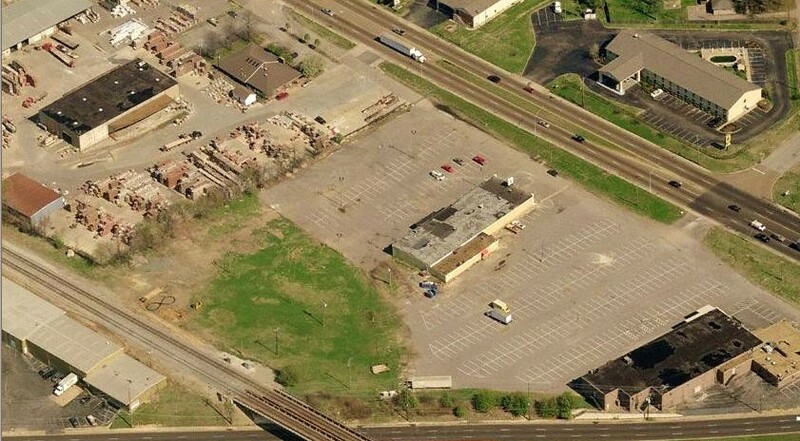 Photo Comments: (Aerial view): Norfolk Southern tracks pass directly in front of the Courtyard by Marriott. Park Ave is the 4-lane highway in front of the motel. (Bottom photo): A eastbound train is stopped in front of the motel waiting for a westbound coming off the single track just east of the motel. This is the only problem that I encountered from this motel. Its easy to miss a train for this reason. The photo is taken from a sliding door on the 1st Floor. Location/ Directions: Take I-240, Exit 15 East/Poplar Avenue. Within 1/2 mile you will pass 3 stop- lights. The hotel is located immediately after the 3rd stoplight behind..BP Gas Station. About Hotel: 4-Stories, 105-Rooms, Interior Corridors, Complimentary on-site parking, Comfortable living areas, sleeping areas. Free high-speed Internet, telephone with voice mail, hair dryer iron/ironing board, air conditioning, cable TV. Residence Inn Memphis East offers complimentary daily housekeeping & grocery delivery service. Smoke Free motel, Air-conditioned, Alarm Clock, Coffee maker / tea service, Fully equipped kitchen, Pantry area, Refrigerator, Stovetop, microwave, dishwasher, oven, utensils, TV features: remote control, 24in/61cm, Plug-In High Tech room, Premium movie channels, Cable/satellite, Cable channels include CNN, ESPN, and HBO, Radio, Pets allowed (fee). Railroad View: Excellent View! A room in the back is needed for a railroad view. Railroad is about 80 feet from the building. There are minimal trees between motel & railroad tracks. There is no need for a high floor since the tracks are located on a high embankment. From the 3rd & 4th floors, the few tree tops are still below the rail, however...a few years down the road that may change. You can also get good pictures from the parking lot; the fence around the motel is still lower than the railroad track which is up on an incline. At night, no problem, you can perch yourself out on the porch. There is plenty of light from the parking lot to not only watch the trains at night, but whip out the video camera and film-away! The Massey Road grade crossing is just east of the motel that may give you head up on an approaching train. Railroads past Hotel: Norfolk Southern, however you may see as much UP and BNSF locomotives as you will NS. Rail traffic is good for a single track. I saw 14 trains during my 14-hour stay. I may have missed some over night. Expect 25+ train's during a 24-hour period. Trains seen during my stay consisted of coal (and empty coal hoppers), double stacks, and general merchandise freight. Power on the coal trains were usually UP & BNSF complete with DPU locomotives on the rear. Notes: Trains pass the motel slowly, but do make noise. They didn't wake me up often although I had the window cracked open through the night. The front desk clerk said many people complain about the trains, there also a sign is each room informing guests as to train noise and offers a "sleeping kit" or a change of room if requested. Comments: I consider this motel a must for any railfan staying in the Memphis area. It looks like it was built to watch trains! The rooms are wonderful, you can live here! It has a fully equipped kitchen and all the comforts of home...plus trains! Photo Comments: These photos were taken from the balcony on room # 412. (Middle photo); An eastbound Norfolk Southern Double Stack train passes the motel. Note newly planted trees are still very small, these will obstruct the view in the future. (Left photo); An empty coal train as seen from the open balcony. (Right photo); Looking west down the track from the balcony, an NS train crosses the Ridgeway Road overpass. The west side of this bridge begins a double track main. It’s not unusual for trains to hold on the west side of this bridge for clearance on the single track. Location/ Directions: 240 East to Exit 21. Motel is located approximately 2 miles from the exit on the left. 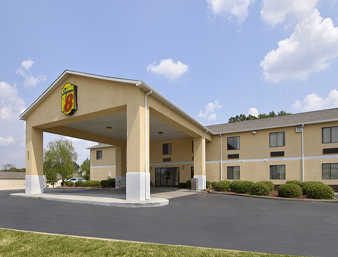 About Hotel: 3-Stories, 134-Rooms, Interior Corridors, Refrigerators, Cable TV w/ HBO, ESPN and many more, Free Hi-Speed Wireless Internet Access, free local phone calls, Pets Allowed, Free Continental Breakfast, AM/FM Clock Radio, Hair Dryers. Railroad View: Good, but distant view. A room on the front of the building is needed, second floor is reco mmended to see above traffic (a lot of truck traffic on Lamar Ave), you will also be looking across a parking lot (usually empty, but truckers may park in the lot for a nights rest). Railroads past Hotel: BNSF Railway. I'm not sure of the train frequency, but I'm told it could get quite busy, coal and double stack trains fill out most of the traffic. 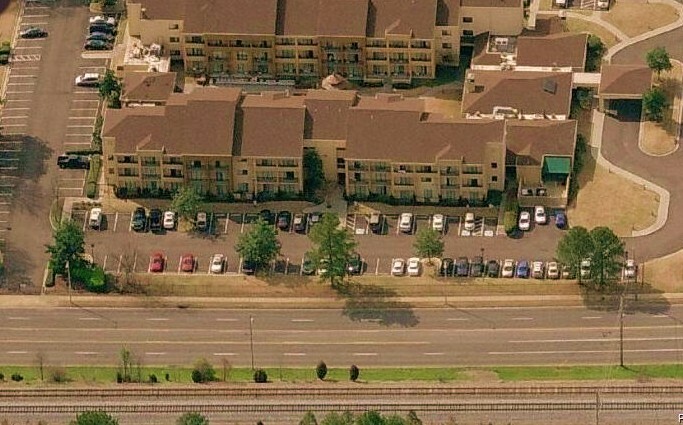 Photo Comments: The Super 8 Motel is located in the upper right part of this aerial picture. The BNSF Railway can be seen in the lower left hand side of the picture.